If you’re looking to see 10+ waterfalls in one 2-4 hour hike, then Silver Falls State Park near Salem, Oregon is a spectacular choice. It’s not a long drive from Portland, and you enter into stunningly beautiful forests. At one starting point, you have South Falls, which is a really impressive waterfall. There are then a number of other amazing waterfalls along the Ten Waterfalls Hike, which has more than ten waterfalls (at least by my count). Think of North Falls as the bookend to South Falls. There is one other waterfall, Upper North Falls, that is further upstream, but some people might not even notice that one. (It requires a deviation from the loop, even though it’s for a very short distance.) There is a parking area that is very close to North Falls, though it is smaller, if I remember correctly. North Falls is awesomely cool because you can walk behind the falls under the very large rock overhang. (There are multiple walk-behind falls in this park.) It doesn’t hurt that the falls clocks in at 136′ tall. The weather fluctuated during the few hours I was there in early May 2010. It was rainy and somewhat cold for the first half of the hike. The sun then came out just as I was approaching North Falls, making it just a bit more difficult to capture good photographs. As I started back on the trail, it clouded up again, and by the time I reached Winter Falls, it seemed appropriate that flurries were falling from the sky! Even in the cold, it was still a great experience, and one that I will likely repeat again. In all, it’s about a 9 mile hike round-trip. From Salem, drive east on US-22 to the junction of US-22 and OR-214. 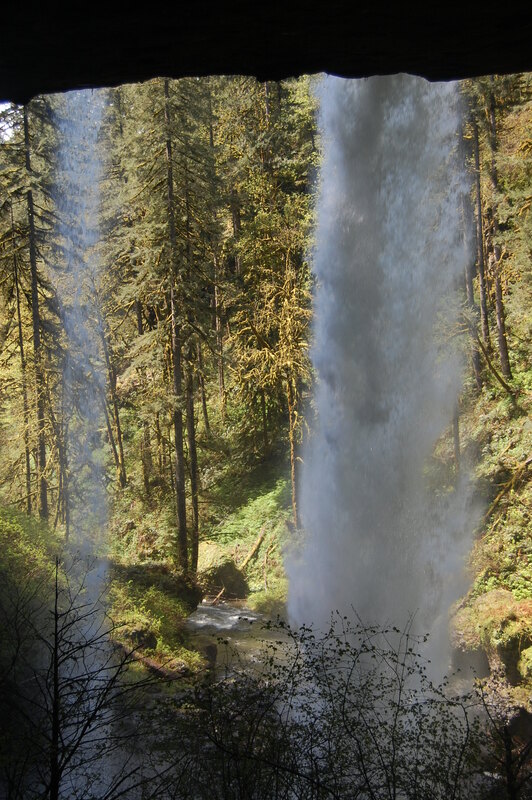 Head north on OR-214 for 15 miles, following the numerous signs to Silver Falls State Park. This is where parking at the North Falls parking lot would be the much better choice if you want to view North Falls. If you park there, it’s just a short 0.1 mile hike to the falls. You can still connect to the Ten Waterfalls Trail from either parking area. The view as you walk behind the falls. Where in the World is North Falls?